I definitely already have a bump of some wort. I feel like I am already showing as much as I was at 18-20 weeks last time! How Far Along? 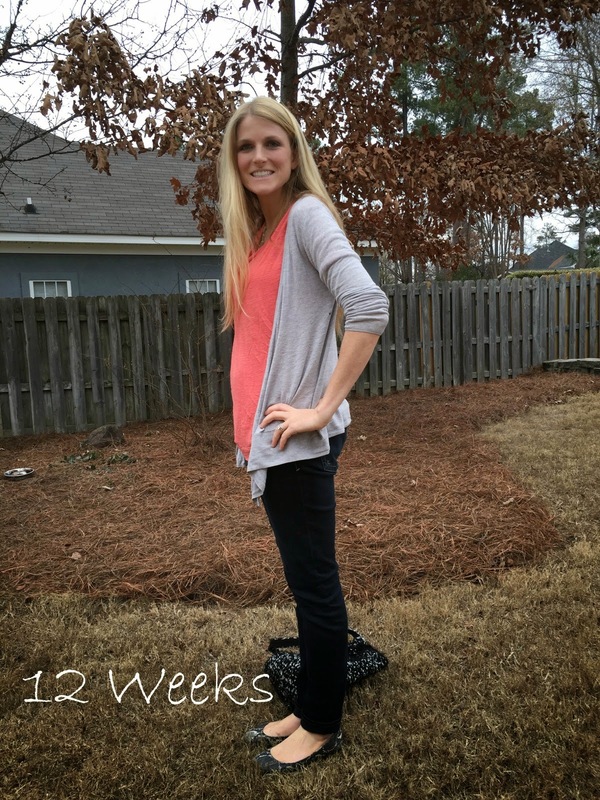 12 weeks… 2nd trimester you are so close! Total Weight Gain/Loss: Honestly, have no idea… we don't have a scale right now. Judging by my awesome bloat, I would say 5-10 pounds. Baby Related Purchases: Nothing yet. I am banking on the fact that we won't need much. One thing we will "need" soon is a stroller… after Thanksgiving break our amazing Bob jogging stroller was stolen from Stone Mountain (it was partly our fault, we left it there). Now we are trying to decide if we want a double stroller and if so which one and trying to find one used at a decent price! Maternity Clothes: I am just wearing loose clothes in an effort to prevent people from commenting on my baby bloat. I have been wearing maternity pants some, not because they are necessary, but because they are so comfortable! Sleep: I am having much more trouble sleeping tun I did last pregnancy. Tossing and turing, trouble getting to sleep and falling back asleep. Movement: No movement yet, but I am already trying to sit still and see if I notice anything! Cravings: Random things and they change from day to day. I feel like no matter what I eat I have a bad taste in my mouth. And I don't want water… which is normally what I drink all they time. Anything making you queasy or sick: Just feel nauseous most of the time, but have not been as physically sick as last time. I am really ready to fully enjoy old again especially since I did not at Thanksgiving… hope I will at Christmas! Gender: We have no idea!!! I did have a dream that we had another little girl that was 10 lbs 1 oz and 22 inches long. Maybe my dream is right? Symptoms: Nauseous all the time, extremely tired… I think more so than last time. And I feel like I look like what I looked like at 20 weeks with BD! Best moments this week: Getting down with school for the Christmas. I love my four year olds, but I am really looking forward to time with Andrew, BD, and family! Looking forward to: We have an appointment tomorrow… looking forward to hearing that heartbeat! We are really excited! Your sister is already excited too… she walks around saying "sissy! "Praying for a good visit at the doctor's tomorrow and continued growth. Praying for your heart!